Download “2019 Outlook: The End of Easy” for an in-depth analysis of economic and market forecasts with emphasis on the global economy, equities, fixed income, real assets, alternative investments and portfolio implementation actions. 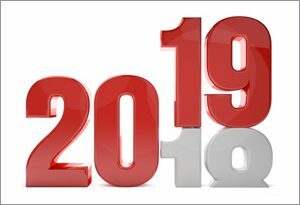 Watch a video with strategists discussing what could surprise the markets in 2019. How China’s rise relates to the dominance of the U.S. dollar, trade, capital markets and the economy. Investors across the baby boomer, Generation X and Millennial generations prepare differently. What the next recession will look like and how investors can prepare their portfolios accordingly. 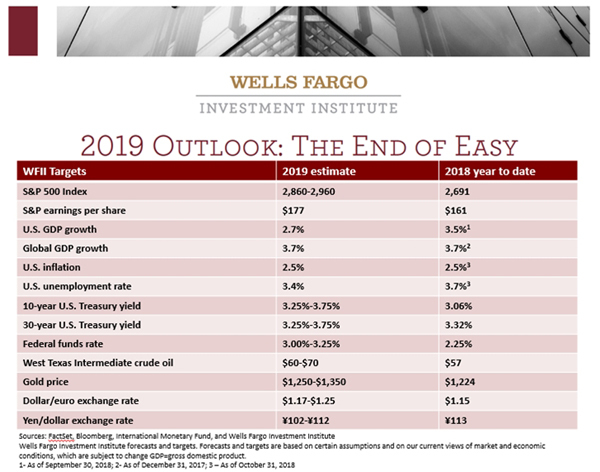 To learn more about the Wells Fargo Investment Institute 2019 Outlook, join Cronk and strategists for a conference call on Tuesday, Dec. 11, 2018, at 4 p.m. Eastern time; 855-458-0619. Wells Fargo Investment Institute (WFII) is a registered investment adviser and wholly-owned subsidiary of Wells Fargo Bank, N.A., a bank affiliate of Wells Fargo & Company, providing investment research, strategy, manager research and thought leadership within the Wealth and Investment Management (WIM) division, with the goal of supplying world class advice to the company’s financial and wealth advisers. WIM is one of the largest wealth managers in the U.S., with $1.9 trillion in client assets. WIM includes Wells Fargo Private Bank, serving high-net-worth individuals and families; Wells Fargo Advisors, the third-largest brokerage firm in the U.S.; Wells Fargo Retirement, which manages $330 billion in employer-sponsored retirement plan assets for 3.9 million Americans; and Abbot Downing, serving ultra-high-net-worth individuals and families. Wells Fargo Advisors is the trade name used by two separate registered broker-dealers: Wells Fargo Advisors, LLC, and Wells Fargo Advisors Financial Network, LLC, Members SIPC, non-bank affiliates of Wells Fargo & Company.